Thaw shrimp, if frozen. Peel and devein shrimp. Rinse; pat dry with paper towels. Set aside. In a large saucepan stir together tomatoes, cornstarch, snipped parsley, sugar, Italian seasoning, and ground red pepper. Cook and stir until thickened and bubbly. Stir in shrimp. Return to boiling; cook for 1 to 3 minutes more or until shrimp are opague. 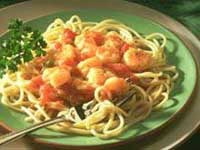 Serve shrimp mixture over hot cooked spaghetti. Garnish with fresh parsley sprigs, if desired.